Like anything else in the online marketing world, your profile and account for Twitter need optimization. The essential Twitter best practices for business relay in their majority on visibility. So, aim for visibility. Ease for others the task to find you, set your account to be searchable and become visible for more people. Your Handle: Keep it simple and short, it needs to have connection with your brand, to be identical if possible. Avoid adding supplementary characters or numbers to your handle to make it unique. If you absolutely need to differentiate from other names, try adding letters. Your Bio: Optimizing your Twitter bio is paramount, especially when speaking about Twitter for business. Conceive a rockstar profile that will attract users to your profile. 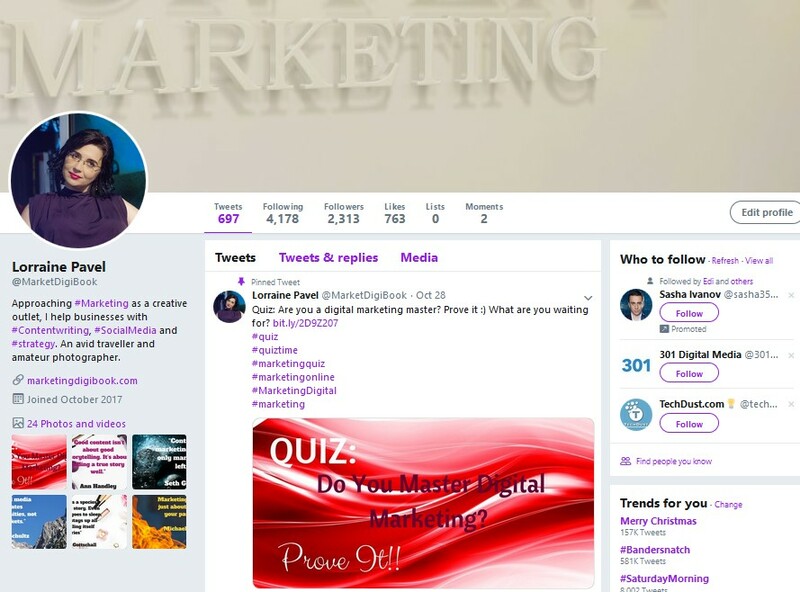 Your bio is the first thing on your profile that users will check on and one of the most important pillars of your Twitter marketing. Insert relevant hashtags for your industry, a link where users or followers are able to find you. Hashtags you employ: There is no secret any-more that hashtags increase reach. As such you have to use appropriate hashtags for your industry or trending topics. Count on a hashtag analytics tool to support you in deciding what hashtag to use. And use maximum two hashtags per tweet. Pinned Tweets: Make sure your display a pinned Tweet on your feed. It is recommended to be a popular and engaging piece of content. As people are more likely to engage with already popular content that others already interacted with. Profit on Twitter Search Operators: Use Advanced Twitter Search, to identify mentions about your product, service or company. Or simply to join conversations related to your industry. Cross promote your Twitter account on other platforms: On your website, on your email list, on other social media networks or within PPC campaigns. Encourage your followers from other platforms to follow you on Twitter also. When you are just starting with your Twitter account and you see accounts with hundreds of thousands or million followers, well that becomes instantly overwhelming and a thought like “I will never be able to achieve such a level of reach…” is teasing you. But be patient, everyone started from zero at a certain moment. Start by following the influencers and most prominent personalities of your industry. Refrain from unproductive methods like buying followers. If you want a relevant, truly engaged following that could convert in customers at a certain moment, build it from scratch. As mentioned above when starting follow all your industry leaders. Use helpful tools like BuzzSumo to identify prominent personalities in your industry. BuzzSumo allows you to see the most shared content in your industry, who wrote it and which companies are generating pizazz. Follow them all. Follow leaders’ followers. Tools like Tweepi or ManageFlitter can help you with this task. The advantage here is that these users are already interested in your industry and expertise area, so more likely to follow you. Exploit Twitter directories. Tools like About.Me and Twellow empower you to find other influencers and users connected with your industry. As you start to build relationships with these leaders, your audience will grow also. Recommend followers. As you do this for others it’s high probability that others will return you the favor. Follow users that mention you – your products/services, your brand or your industry/niche. Tweet famous and inspirational quotes – People in general enjoy greatly inspiring quotes and they share them with their following. So, this is a simple strategy that will get you retweets and increase your reach. Organize or promote a contest. If you want to expand fast the number of your followers, this is a proven way. Even if the quality of the acquired followers might not be the best, it’s recommended to award a prize that is interesting for your buyer persona. (Do not decide for a smartphone – as this will be of interest for anyone, try a paid course or a subscription to a relevant tool). Test promoted tweets. If you consider you need some extra exposure, you can also try the promoted tweets to expand the number of persons you reach. Twitter offers various targeting options to select whom exactly will view your tweets. Tweet daily at least once: Keep your feed active, tweet at least once each day. You may want to try posting 3 times a day for a month for example and analyse the results. Establish a rate of followers’ growth for a six-month period. Input effort to see each month an advancement comparative to the last month. Be followed by 5 influencers. This will help accelerate your following development. Engage your audience more. Take 5 minutes each day to engage on Twitter: to reply, retweet and like. Establish clear goals depending on your purpose. Get involved in Twitter Chats. 1-2 per month for instance. Twitter chats are events hosted by leaders and businesses and are very frequent. Make use of tools like Twubs or Tweetchat to find or host such chats. Twitter Analytics is the tool who dictates the fundamentals of your decisions concerning your Twitter activity. Measure the results of your Twitter marketing efforts to see what’s working best for your audience and where you need to direct more resources. Measure the number of followers, impressions, likes, mentions, link clicks, etc. Use social media analytics tools like SemRush, Sprout Social, Followerwonk for supplementary insights. Engaging is the mantra of social media and Twitter is no exception. The basics of Twitter are the micro conversations and it’s among the first places to give feedback, ask and answer questions. Sprout Social Index Q3 2017 reveals that 45% of consumers contact brands on social media to obtain a response or resolution. Engagement is a pillar and paramount request of consumers on Twitter, so, search for the right balance between conversation and promotion. The recommended ratio is 80% versus 20%. Ask relevant questions and run polls. Don’t just ask questions for the sake of conversation, try to ask questions that uncover insights and different points of view related to your products or services. And as bonus this will revive conversations. Respond immediately, retweet and @mention others. Responding quickly shows others that you are active, retweeting content posted by others and mentioning other users creates premises that others do the same for you. Curate carefully your retweets, as they will reflect on your business and should be in line with your core values. Tweet trending events and breaking news. Use the “trendjacking”(association with a trend for awareness purposes) technique in your favor. Conceive a way to originally associate your company with the trend. Join the conversation and tweet others daily. Comment on other users’ tweets, built conversations as often as possible to expand your reach. Use just your best content for marketing on Twitter. People are more likely to share valuable, well researched content. Preferably evergreen content. Talk about industry events. Ask for details and opinions of those who were present at a certain event. You will gain insights, interact with industry influencers and brand ambassadors. Count on visuals. Insert images, gifs or videos in your Tweets to increase your engagement rates. Engagement, in general, is triple for visual Tweets, so exploit them. Consistency is the basics for Twitter marketing. Tweeting can be a time-consuming activity, so in order to streamline, the best way is to use a social media management tool to help you schedule your tweets. Tools like Hootsuite, Buffer, MeetEdgar, CoSchedule offer you the modality to plan your tweets and stay organized. Thus, this activity will consume a few minutes a day or several hours a month, without even being logged on the platform. Don’t forget to be authentic in your tweets! It’s your most original asset. Depending on the level of your twitter account, you may have to do a part or even all these tasks. 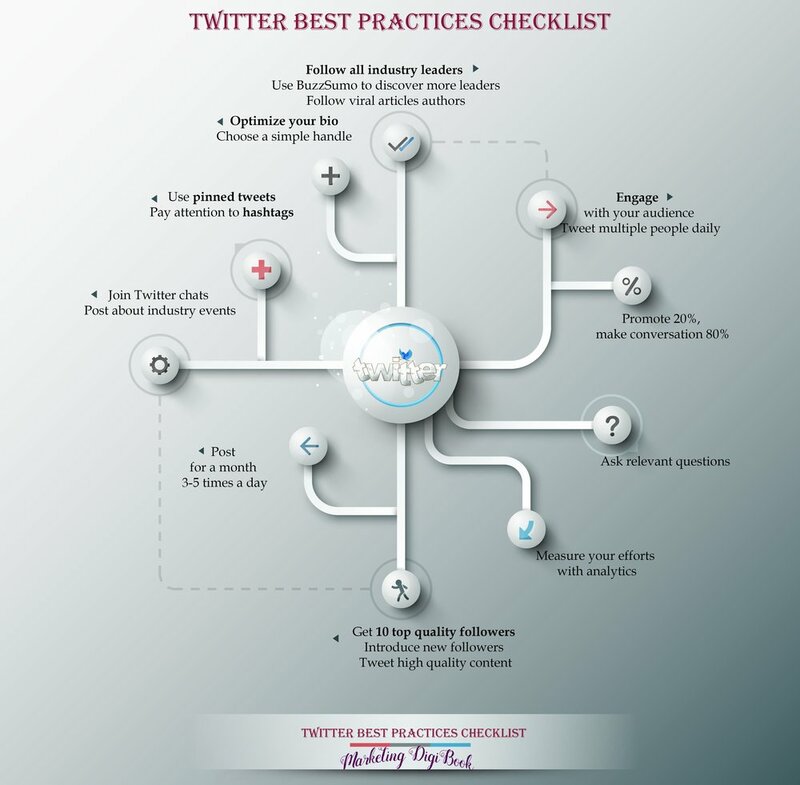 Here is a synthesis, a checklist of Twitter best practices for business to help you tick them easier. Twitter and social media are part of a young industry and they are continuously evolving. 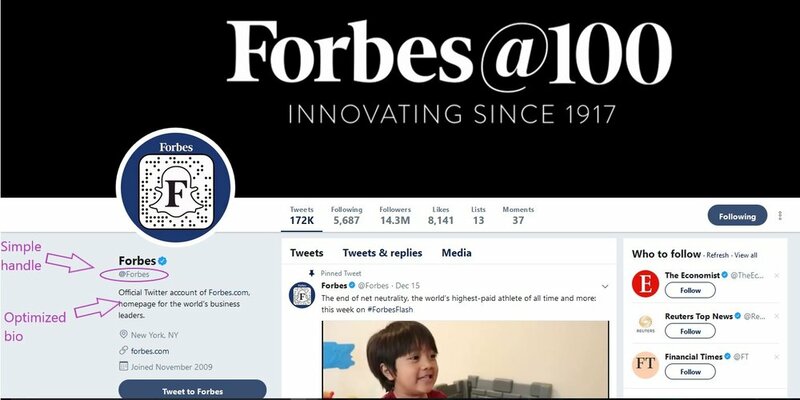 As consequence, these Twitter marketing best practices change in time, so you have to keep learning and be up to date with the modifications that will interfere. And your following will continue to increase and probably generate more customers and business.